Are you and your spouse searching for a happy home? These are things that most of us who are married do reflect on. Some of us are wondering why these amazing things are missing from our marriage. And some of us thank Allah that we have found such blessings in our relationship. And still others go back and forth depending on the day. I think most people, if they are honest, will tell you that marriage can be a source of peace, tranquility, mercy, and love if both spouses work at it. Like most wonderful things in life, a happy, healthy marriage doesn’t just happen. It has to be built and maintained. 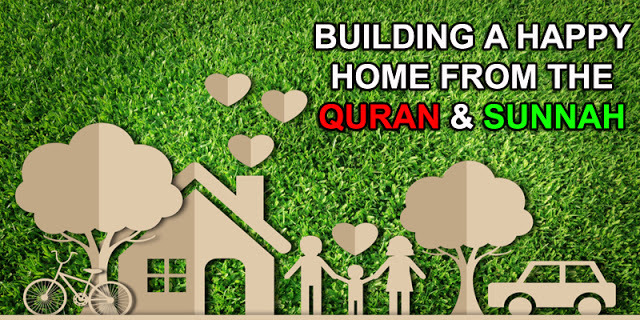 Establishing a marriage based on the love of Allah and thereby a solid foundation between two people can be simple in the early days of a marriage, but is a pain if the structure is built and then you realize that the foundation work is shaky and needs to be redone. It is best to start with a good foundation. Do things for each other to seek the pleasure of Allah. When we do things day after day for our spouse, we can often feel unappreciated and find the acts unrewarding. And after years of doing things for your spouse, many people find themselves resentful. But when we do things, not for the sake of our spouse, but seeking the pleasure of Allah, our reward will never be lost. Allah is All Aware (Al-Khabir), the Most Appreciative (As-Shakur). Once a firm foundation is established based on mutual love for the sake of Allah and seeking His pleasure, the framework for the marriage needs to go up. How will you run the house? Who pays the bills? Who does what around the house? Money. Work. Children. This is where the headaches and arguments come in. It is inevitable for two people who are in a relationship to come to places where they disagree on how to move forward. Some people descend into rages or insults at the first sign of not getting their way. Some people even use manipulation or coercion to try to gain ground in disagreements. This only leads to hurt feelings and resentment, and a shaky framework for a marriage. But I find that arguing with manners applies in most situations when you are trying to get someone to see where you are coming from. And what else is an argument between spouses but trying to get the other party to see your side? Turning our hearts away from the deen of Islam is the worst thing that can happen to us in this life. So if needless arguing is this destructive in life in general, then think how destructive it can be to a marriage? Let some stuff go. Being the first to say you are wrong even when you know that you are not, not only guarantees you a house in Jannah, it also helps you disarm your spouse in an argument. By conceding, you are often create an atmosphere where discussion can take place openly and free from defensiveness. The natural progression of a building project will tell you it is time to put a roof on it. You established a foundation build on the love of Allah, navigated arguments with manners. Putting a leak proof roof on seems obvious, but the materials needed are so simple they can often be overlooked. How can you not love someone who wishes you peace often and sincerely? Your spouse needs your charity and a kind countenance to meet them. Tell them you care for them. Don’t just assume they know it. If you like to hear it, chances are, so does your spouse. Who doesn’t need Allah’s mercy? Once the marriage is built, the work is not over. Sometimes the roof needs to be replaced. Other times there is a crack in the foundation. Maintenance is a fact of life. So continue to do all of these things in terms of loving for the sake of Allah, smiling, greeting with salams, arguing with manners, forgiving and admitting fault, and so on, making sure to put in the work when major overhauls need to be done.